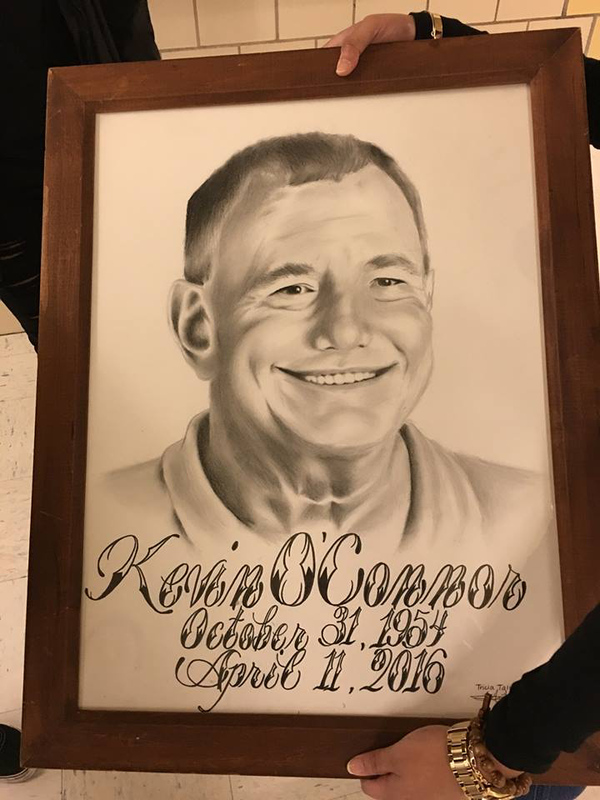 So said one of my colleagues at the ceremony we held for our fallen friend Kevin O'Connor. 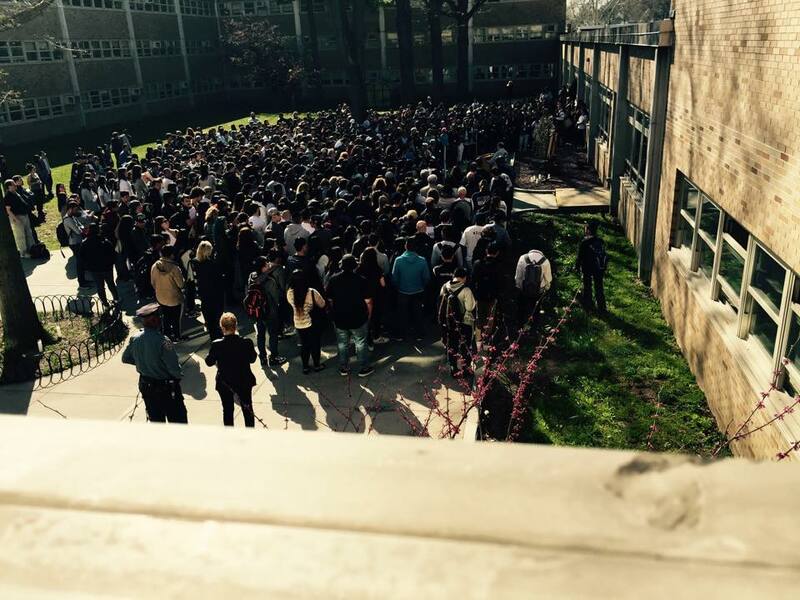 This is a photo someone took of the thousand people who came to our courtyard last Friday to pay him tribute. We get checklists, rubrics, numbers and most of us don't even understand what they mean. If they say, "effective," we sign the sheets and don't even bother to read them. What's really the difference? Students didn't come out there wondering how he did on 4C, or 2B, or not 2B. Students lined up quickly. The school provided 300 carnations to drop in his honor, and the kids snapped them all up well before the ceremony even began. He listened to me, they said. He understood me. Even when I was wrong, he listened. He didn't judge me, he helped me. He made me learn how to play the guitar. When I got into a fight he talked to me instead of just dragging me off and writing me up. He understood them. He couldn't help it because he still had a lot of teenager in him. He still loved all the music he grew up listening to, and oddly, a whole lot of the kids seemed to love it too. One girl spoke in detail about their shared love of Pink Floyd. Even as a teenager they didn't appeal to me, so what do I know? But Kevin inspired her to learn Wishing You Were Here and that was exactly what she was feeling at the moment. Students choked up and broke into tears as they spoke. One girl got up and read a poem about him. Our students were passionate and eloquent. A portrait of Kevin, drawn by one of our students the day before, adorned the stage. A math teacher spoke of how he was a fixture in our school. His only fault, he said, was that he was a Yankee fan rather than a Met fan, but he was willing to forgive this, much as it pained him to do so. A great teacher inspires. A great teacher touches lives. A great teacher makes kids want to come to school. It's abundantly clear that Kevin did all three. 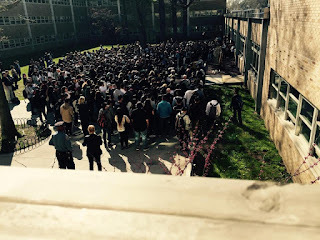 I saw some of my own students, ELLs who'd been here a very short time, crying inconsolably. I was very touched by things students said about him. I know he was troubled by the rating system, but I'm going to offer his final evaluation on this astral plane. The kids loved you, Kevin. There is nothing more important than that, not the grouping, not test scores, not Danielson, not the Quality Review, not rigor, not grit, not anything else we do. They counted on you for support and always knew you were there. They may or may not have had support at home, but they knew they could come to you. They appreciated you, and they will miss you.